Today of all days, having the munchies can only mean you've been doing one thing: going to morning Spin class, because, hey, swimsuit season is right around the corner! Well satisfy that righteous hunger, with The Munchie Machine. 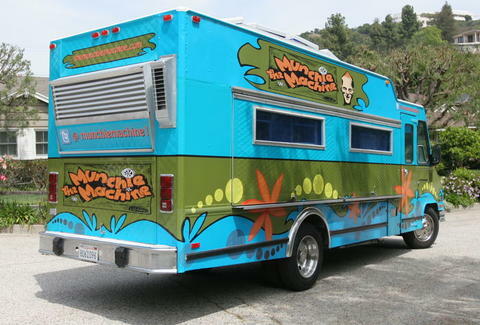 The Munchie Machine's a new sandwich-and-more truck all brightly-dolled up to look kinda like the Scooby-Doo Mystery Machine, started by two Brentwood-based friends-since-kindergarten who came up with the concept when one of their bosses at Jody Maroni's decided not to pursue launching a truck -- so, his loss, your (uncontrollable weight) gain! Currently, the menu's sandwich-heavy, with ciabatta/6-grain/sourdough options including The Green Bird (smoked turkey/pesto/roma tomatoes), The Don (Genoa salami, cappacola, ham, roma tomatoes, pepperoncinis, dijon mustard, mayo), and the Croque Du Munchie (honey cured ham, dijon mustard, mayo, fried egg); coming soon's pizzas, bowls, and "anything else you'd want" -- so they better come up with those gum cigarettes with the powder sugar smoke puff real quick. If you're more snack-inclined, they've got hand-cut fries (w/ optional, homemade chili), as well as S'mores that're customizable with your choice of flavored marshmallow, the options including caramel, coconut, and cinnamon, but unfortunately not Jessica Simpson-in-one-of-her-fat-stretches-where-she-wears-the-high-jeans flavor. Tonight, they'll be having a launch party at the Bigfoot Lodge West with a one-off $5 drink special; after that you can follow them on Twitter, or send them a request to come to you, because today of all days, there's nooooo way you're even thinking about driving (what with the leg soreness and all).